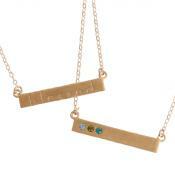 We added a little personal touch to the Follow your Arrow necklace and added a birthstone! 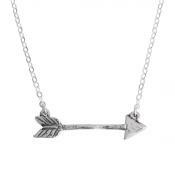 We hand carved the arrow out of wax and had it cast in sterling silver so it is a design unique to our line! 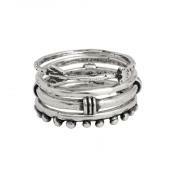 The silver is oxidized to give and metal and organic feel and show detail. Just to show it is your arrow, we wanted to personalize the necklace by adding a birthstone. Available in 16",18" or 20"
This personalized birthstone Arrow Necklace will remind you to follow your path with all your heart. “Pursue some path, however narrow and crooked, in which you can walk with love and reverence." The arrow is 1 1/8" long and 1/4" wide. The necklace is sterling silver and available in 16", 18" & 20"
I have purchased rings from you before along with necklaces . I first saw an ad on Oprah favorite things, and I loved all that I purchased.